Are Absolute Returns Absolutely Impossible? This article discusses absolute return funds implemented by UCITS funds. With the reappearance of volatility in the markets – not just in equity markets but also in other assets classes e.g. fixed income or hard assets as well as among markets globally – absolute return funds, with their promise to protect capital in any market environment, are enjoying increased interest from investors. The first two sections introduce the reader to absolute return funds and their strategies while the third and fourth part discuss their attractiveness for investors and their potential risks. In the last part, we analyse an absolute return fund that we became aware of when conducting our research and which we find worth to take a closer look at. Part 1: What are absolute return funds? Absolute return investing aims to generate positive returns, regardless of the general market conditions. This means that an absolute return fund may still be able to generate positive returns even when markets drop sharply, although this is of course not guaranteed. The investment style of absolute return funds can thus help to smooth returns throughout the market cycle. The investment objective of these funds is to beat cash-like returns, since the risk profile of absolute return funds is by definition similar to cash. The Investment Association (IA), the trade body that represents UK investment managers, updated the name in its sector definition to Targeted Absolute Return and requires funds to state the time horizon over which they aim to achieve their investment objective, which must not be longer than three years. Typically, the targeted timeframe is a rolling 12 months basis. Part 2: What are the key techniques employed by the sector? Absolute return funds must employ strategies that allow them to profit from both, the ups and downs in the market. They do so by combining a variety of approaches which can be employed to a number of different asset classes, such as equities, bonds, or commodities. Often, absolute returns funds also hold high levels of cash in order to reduce the risk profile of the fund. This may sound familiar to strategies employed by e.g. multi-asset funds. The difference between the two strategies is that multi-asset funds are classified based on the asset-types they hold whereas absolute return funds are defined by their type of returns. Absolute return funds are by their classification not limited to any asset classes and may as well hold equities, bonds or derivatives. Generally speaking, absolute return funds may use derivatives to a greater extent than multi-asset funds, stemming from their desired market neutrality. A very effective strategy of absolute return funds in order to reduce a high degree of market risk is a technique called pair-trade. A pair-trade aims to return a profit through the relative change in the value of two assets. The pair-trade works as follows: the portfolio manager identifies two assets in the same industry. One asset that he or she believes will thrive and one that is expected to underperform. By simultaneously going long the former asset and going short the latter mentioned asset, the portfolio manager profits from the differences in the prices of the assets. As short positions profit from devaluations of the underlying asset and long position profit from rising valuations of the asset, the fund manager can therefore significantly increase profits from a successful pair trade. It is worth mentioning that a portfolio manager can profit from such a trade even when both assets decline in value, as long as the decrease in the short positions is larger than in the long position. In addition, since opposite positions in companies within the same industry are being taken, systematic risk is largely eliminated since the overall direction of the market is almost irrelevant. This shows how an absolute return fund may still be able to generate profits in any market environment, whether prices are rising or falling – given the portfolio manager is correct with his or her pair-trades. Since UCITS funds are by legislation not allowed to actual short stocks, they enter into derivative contracts that allow them synthetic shorting. The type of derivatives most commonly used by UCITS funds are contracts for differences (CFD). A CFD is an agreement between two investors with different views on a stock. While there is no physical exchange of the underlying asset, the two parties agree to reimburse the other party with a payment at the end of the contract, depending on the price change of the stock. The short position in the CFD must make a payment if the stock price rises while the long position needs to pay the short position if the stock price declines. The amount of the payment equals the change in the stock price. Of course, absolute return funds not only use CFDs for short positions in stocks but also for long investments. This allows the fund manager to gain more exposure to a particular stock than with a conventional ‘buy-and-hold‘ strategy. Since the collateral for such a CFD position is much smaller than the actual price of the stock, the fund manager can use the remaining capital to invest in other attractive investments and thus leverage the fund‘s exposure to a wider range of investments. Given their characteristics, absolute returns funds are considered more defensive than conventional equity or bond funds. They can therefore balance the risk profile of other investments in the market while generating superior returns to cash. Especially in times when market corrections are expected, investments that are seemingly immune to market movements become even more attractive. The so often mentioned historically long bull market of stock markets and the return of volatility to markets in the past months worry investors about larger market corrections. In addition, the beginning of quantitive tightening by an increasing number of central banks causes interest rates to rise while simultaneously the outlook for stock markets are dampened by trade tensions and less prosper growth estimates. This environment may cause both, bond prices and stocks prices to drop sharply as seen in February this year. Thus, the usual model of diversification by investing in equities and bonds may not help to reduce portfolio volatility. In this light, absolute return funds seem like an attractive investment for risk-averse investors, looking for capital protection. Part 4: Making the impossible possible? While it sounds very attractive for an investor to generate positive returns in all market conditions, this section deals with taking a closer look how well this actually works. This first thing worth mentioning is that there are lots of different management strategies that fall under the umbrella of absolute return. Some of them may be easy to understand for investors, others are incredibly complicated and leave investors without any chance to actually understand what they‘re buying. The aforementioned IA states on its website that comparisons across the whole sector are inappropriate because of the large differences among the funds regarding their different benchmarks, timeframes and risk characteristics. However, this still allows us to have a look on how well these funds hold up to their promise of delivering positive returns. The IA provides monthly data on how many times a fund in the targeted absolute return category failed to deliver positive returns after charges on a rolling 12 month period. Even though the time horizon of individual funds in the sector vary, the IA decided on the period of 12 months based on the wide expectation of investors to return positive returns after 12 months. As the table below shows, about 6% of the funds in the Target Absolute return sector of the IA failed to deliver positive returns in any 12 consecutive months over the past 2 years. This shows that positive returns are by no means guaranteed. Losses of absolute return funds can be amplified by what is known as ‘market leverage‘. Even though UCITS funds are not allowed to borrow capital to finance investments, the use of the aforementioned derivative strategies allow funds to gain exposure to positions in the market with only a small initial payment, compared to the required capital when buying the physical shares. This could increase profits but also increases the risk profile of the fund. Also important to consider for investors is the fee structure. Absolute return funds tend to have performance fees (in the range of 15-20%) if the fund returns more than the set benchmark. In the final section of this article we want to discuss the past performance of an absolute return fund and its attractiveness looking ahead into the market cycle. At this point we want to stress once again that comparisons among absolute return funds are in general not appropriate, given their heterogeneous characteristics discussed above, and therefore the discussed example in this section does by no means stand for the sector of absolute return funds. 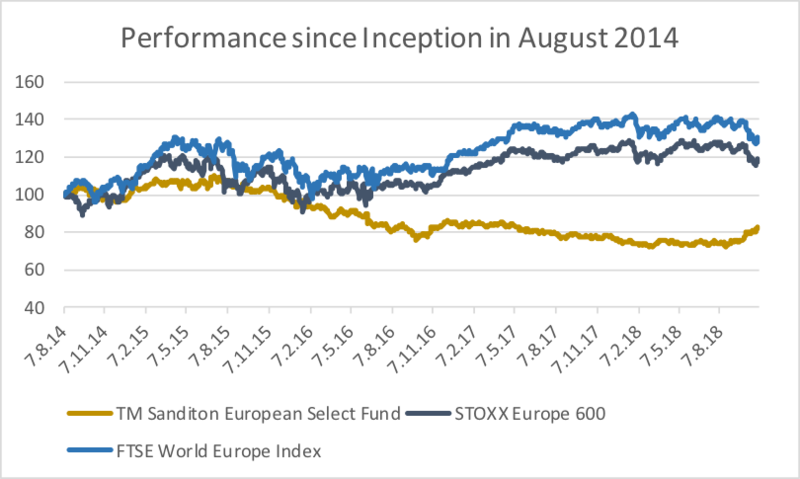 The fund that caught our attention is the TM Sanditon European Select Fund (TMSE). Since its inception in August 2014, the fund is managed by Chris Rice, who manages the European funds at Sanditon Asset Management. The investment objective of the TMSE is to generate positive real returns that show a lower volatility than the FTSE World Europe Total Return Index. The return benchmark of TMSE is to deliver returns in excess of 2% p.a. of the EU Harmonised Index of Consumer Prices (HICP). The investment universe of TMSE are listed equity securities that are issued by companies established/operating in Europe and derivatives that may give short or long exposure to these equities. The chart below visualises the performance of TMSE (total return) against the FTSE World Europe Total Return Index and the STOXX Europe 600 (total return). While it is not the investment objective of TMSE to beat any of the two other indices, the graph shows clearly that TMSE is remarkably down since its launch in 2014. TMSE has indeed a correlation of very close to zero to both indices. The table below also shows how drastically TMSE missed its return objective to deliver excess returns of 2% p.a. over the HICP Index. Nevertheless, the return volatility of TMSE was lower than in both, the FTSE World Europe Index and the STOXX Europe 600 Index, as shown in the last row of the table below. The reason for this extreme underperformance of TMSE stems from the conviction of fund manager Chris Rice that the economic cycle is in a late stadium – already at the end of 2014. Clearly, this wrong timing of the market costed the fund money. When the fund was launched in August 2014, Rice tilted the portfolio of TMSE towards defensive stocks, since they’re known to be more robust in times of bear markets (see also our publication “When Cyclicality becomes attractive” from 28.10.2018). Due to the underperformance of defensive stocks at the end 2014, TMSE started generating negative returns during its first months. In January 2015, the ECB launched its 60bn-a-month bond-buying programme. Due to this enormous monetary easing, Rice saw the chance of an appreciation of value stocks, that may cause an underperformance of high valued stocks in the defensive sector. While still being convinced that the economy is late in the cycle, he still kept a large contribution in defensive stocks but tilted the fund towards more cyclical holdings, as can be seen in the table below. Source: Bloomberg. Data as of 31.12.2018: Communication Services is counted towards defensive stocks in this illustration, as the Telecommunication Sector (which used to be classified as Defensive) was broadened and renamed as Communication Services, effective as of 28.09.2018. It was especially among banks where Rice saw potential for value stocks, titling the portfolio starkly towards stocks from the financial sector. Banks underperformed heavily after the QE announcement and therefore seemed to have a lot of value potential. Also, Rice saw the potential in stocks like Atresmdedia or Peugeot to rise to similar profitability as their US peers. These were indeed good picks, since both stocks rallied in the period from the launch of TMSE in August 2014 to August 2015. Atresmedia appreciated 21% in price while Peugeot‘s stock price soared by 78%. It was not the long positions that hurt portfolio performance, but the short book. Slowing growth in China in June 2015 as well as anticipations that rising capital costs would put pressure on their margins, Rice shorted stocks from the cyclical sector such as Altice, Fuchs and Kuka which were trading at 53x, 24x, 31x earnings, respectively, at this time. The price appreciations of these stocks hurt performance in 2015. Especially the short position in Kuka proved to be hurtful. In May 2016, Kuka‘s shares rose by 26% within 10 days as Midea bid for share capital of the German robotics supplier. In June 2016, Rice was convinced that it would not need many rises in interest rates in the US to bring the bull market in equities to an end and positioned the portfolio in order to profit from a more difficult market environment in equities. Putting a focus on value defensive stocks, the average P/E ratio of the long positions was 17.5x, whereas the short book was depicted of cyclical industrials, to large parts car manufactures and their suppliers, averaging a P/E ratio of 25x. This positing was based on predicting increased volatility in equity markets which would weigh on their valuations. Such conviction is also reflected by the reverse of the portfolio tilt for the period from August 2015 – August 2016. The long positions in cyclical stocks were reduced by 15% while increasing the tilt towards defensive sectors. Also notable is the increase in Cash holdings. This was hurtful for investors outside the UK, as the pound depreciated heavily after the Brexit voting in June 2016 (the exposure was not fully hedged). In 2017 growth stocks continued to outperform which was again painful for the fund with its value skew. However, going into 2018, economic momentum began to wane and stock markets began to react more heavily to earning reports. This created an environment that was beneficial to the strategy of TMSE. The table below shows the average yearly returns from the stocks in the 2nd and 3rd Quintile of the STOXX Euro 600, ranked according to their total return in the respective year. This table shows that the market doesn’t appreciate as homogenous as it did in the previous years which creates opportunities for the strategy run by TMSE. Source: Thomson Reuters. Data last updated on 07.11.2018. The drop in stock correlations among indices have collapsed to historically lows. Since most active funds underperformed during the volatile weeks of this year, this seems like funds bear more factor risk (e.g. exposure to momentum) than idiosyncratic risk. Rice increased the tilt of the fund towards defensive stocks as of October 31st, since profit margins already started deteriorating among more cyclical businesses. The cheaper valuation of the defensive stocks, compared to levels of 2014, held by TMSE is promising for future performance. Rice doubled long holdings of Sanofi, TMSE largest return contributor in the past year, in March when the stock was trading at 23 times earnings. This compares to almost 30 times earnings when the stock was in the portfolio of TMSE in 2014. As of October 31st, the long positions held by TMSE trade at 21 times earnings, weighted by their portfolio contributions. These measures showed their first effects this year. Past October was tough for most investment strategies, as markets around the globe took a deep dive. The FTSE World Europe Total Return Index was down by 5.9%. This compares to a positive return of 6.7% generated by TMSE in the same period. It was not only the short book of TMSE that outperformed the market (up by over almost 9%) but also the long holdings of TMSE, that were only down slightly more than 2%. Similar was seen for smaller market corrections throughout the year. What is slightly disturbing is that TMSE is one of the very few absolute return funds that were able to generate positive returns in these volatile market environments. Weren’t they supposed to be constructed for exactly such environments? 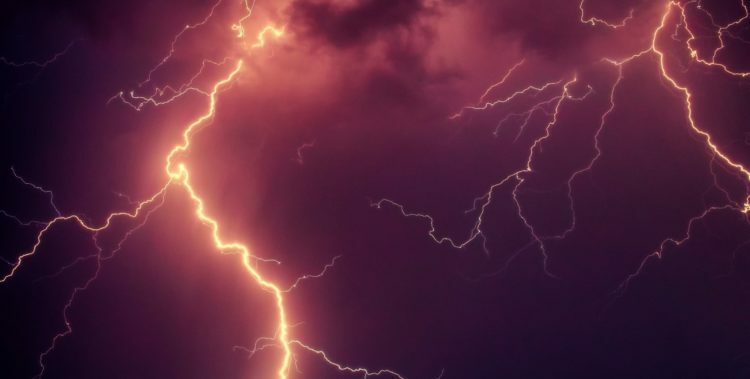 For investors who expect future volatility in the markets to increase, the strategy of Chris Rice and his TMSE fund may be worth considering, since it proved to deliver when markets get rough. To sum up this article in a few words: absolute return funds bear remarkable risks which investors should be aware of. Also, as just seen with the example of TMSE, a long bull market can deteriorate capital invested in such strategies. Always remember the wise words of John M. Keynes: “the market can stay irrational longer than you can remain solvent.” However, for investors who look for a place to hide when common diversification strategies seem not work as they used to, absolute return funds may be a solution that’s worth considering. One must note though that the investor should ensure about the strategy of the fund, as the sector of absolute return funds is very heterogenous – regarding both, risks and rewards.